Welcome to flash gum, a creation of João Miranda and Julio Montoro. This is a visual trick that will leave your spectators totally speechless. In this effect three cards are chosen and lost in the deck. After a magical pass the cards are gone from the deck and travel into a pack of gum. The first card appears visually on top of the gum packet, and in the second phase the whole packet visually morphs into the other two selections. Flash gum looks like real magic and the gimmicks are always ready to go in a moments notice, taking only a few seconds to reset. This is how real magic should look like! 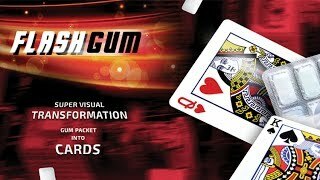 Get flash gum now and get ready to astonish your audience with a casual and yet very powerful visual illusion. - A pack of gum is included along with the gimmicks and intructions. - TV rights are included with the purchase. A visual trick where the first card appears visually on top a gum packet, and then the whole packet visually morphs into the other two selections.